Drivechain allows BTC to travel to other software applications, and back. With DC, Bitcoin-owners can use their BTC on Ethereum-clones, BCH-clones, Monero-clones, etc. Two existential threats to BTC are neutralized – hard fork campaigns, and altcoin-competition. BTC development becomes anti-fragile with respect to CoreDev mistakes. BTC maintains hashrate security in the long run. BTC can scale to credit-card level txn-processing – without changing the CONOP of Bitcoin Core. These cheap txns have optimal fungibility and supply vital pretext to the BTC ecosystem. BTC gains new, experimental abilities, especially P2P event derivatives. Per learning theory, here is an explainer written by someone who just learned Drivechain. 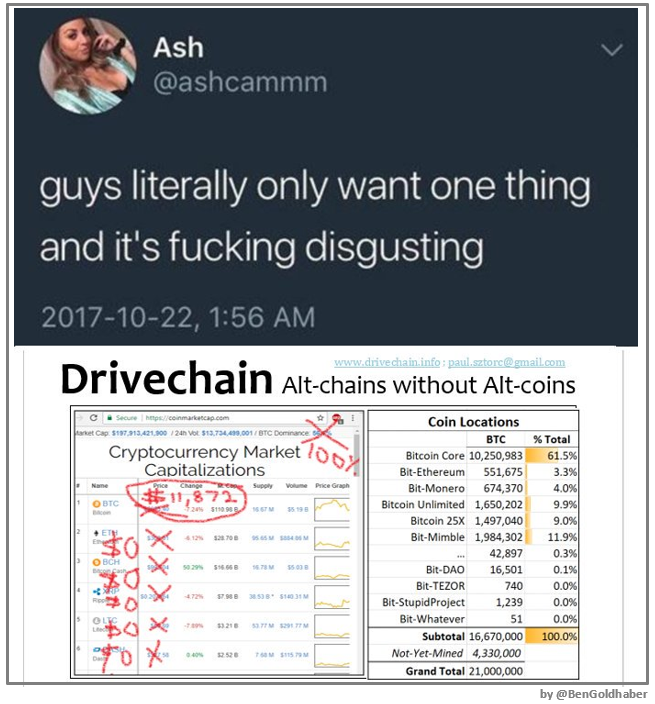 View the main critiques of Drivechain. Go here for a guide on downloading and using this software. It has screenshots to help walk you through the process. 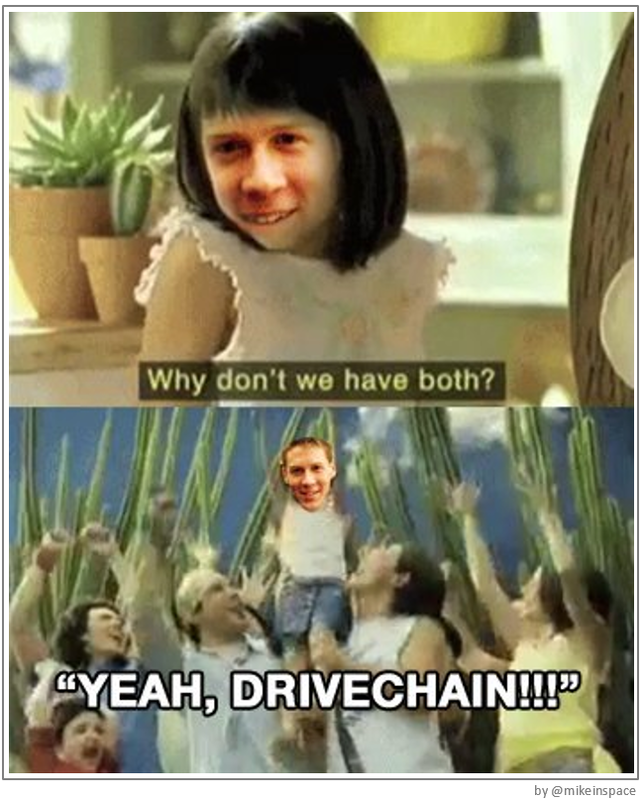 Hang out with us by joining the Drivechain Telegram Group. Check out this DriveNet Faucet, and this SideShift (Instant Sidechain Withdrawal Service) project, and this blockexplorer. All by @abrkn. Hashrate Escrows – “Container UTXOs” that compress 3-6 months of blockchain data into a fixed 32-bytes. Blind Merged Mining – Replaces the act of running a sidechain node with the act of including a single high-fee transaction. Blockchain technology has economic tradeoffs, and users disagree over the optimal tradeoff. But only one group can have their way at a time. Instead we need multiple heterogenous layers (Satoshi, Finney). 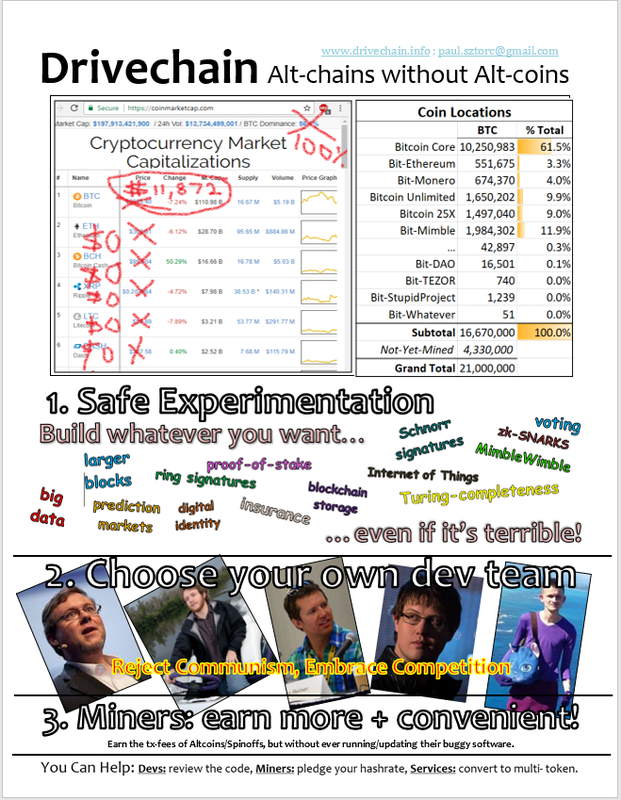 Bitcoin investors must worry about competition from other projects (Ethereum, Z-Cash, Ripple). Satoshi, creator of Bitcoin, wanted to support many transaction types, but knew that his design was prohibitively inflexible. Bitcoin is supposed to be used as money, but if it cannot be used on some networks, it is constrained as a medium of exchange – and therefore at a competitive disadvantage. Instead, sidechains are alt-chains that all use the same Bitcoin token. They start with zero coins; they accept Bitcoin deposits, conduct Bitcoin transfers, and finally dispense Bitcoin withdrawals. Permissionless Innovation: Anyone can create a new blockchain project, without facing the (near-impossible) task of also bootstrapping a new unit of money. Eliminates Competition: Bitcoin will always have the best code, because it can copy any code that exists. 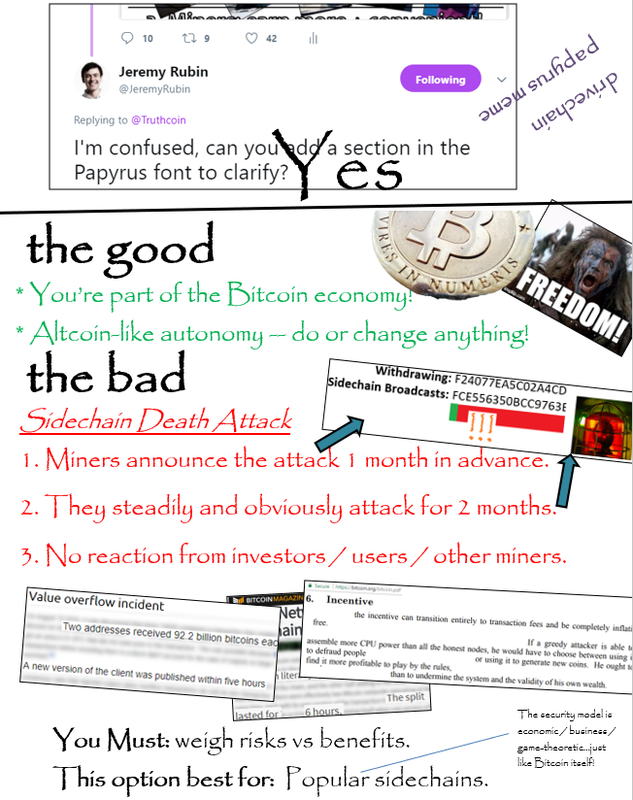 Freedom to Choose: Satoshi’s consensus protocol requires everyone to agree on everything, down to the very last byte. Sidechains allow users to choose which benefits they would like to pay for. Anti-Scam: SCs filter out get-rich-quick schemes (the ‘get rich’ part is now impossible). Therefore, good projects can stand out and receive our attention. Faster Progress: SCs let us test new features. The tests are safe – if these features fail, they won’t take down the main network. However, the tests are also informative – real BTC is on the line. I'm usually on Twitter 8-9 AM and 5-6 PM.